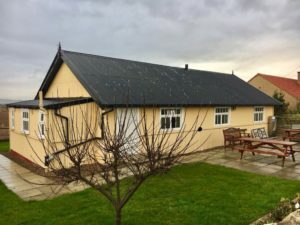 Morham Village Hall, in its beautiful rural location, is available for event hire to hire for children’s parties, community events, weekly classes and functions (seats 70 for dinner). The main hall area has a solid floor (uncarpeted), windows along each side and a stage area to one end. Benches, tables and chairs are available for use. Facilities include central heating, well equipped kitchen, ladies and gents toilets and cloakroom area. Behind the hall is a children’s play area with swings, climbing frame and rockers. The hall is owned and run by the community of Morham. We use your personal data for the purposes of managing the hall, its bookings and finances, running and marketing events at the hall, staff employment and its fundraising activities. Data may be retained for up to 7 years for accounts purposes and for longer where required by the hall’s insurers. If you would like to find out more about how we use your personal data or want to see a copy of information about you that we hold, please contact the hall Secretary.